Enjoy a great start to your day by meeting new business associates at A.M Oshkosh. 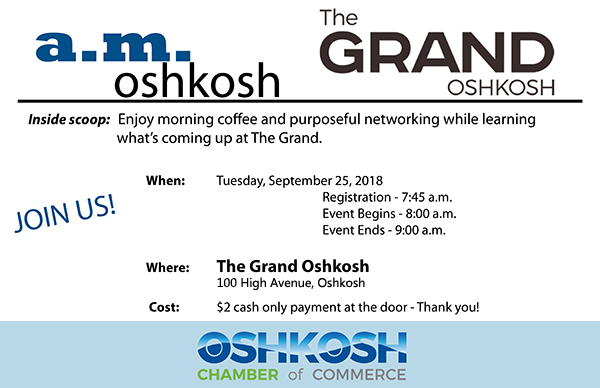 This month we will be at The Grand Oshkosh enjoying some morning coffee and learning more about the upcoming shows at this historic venue. There will be a drawing for two tickets to PUSH Physical Theatre’s DRACULA. 8:05 a.m. - Executive Director, Joe Ferlo, will welcome everyone and talk about The Grand and the new season. He will also be leading a tour of the theater.